The Lanier LF310, LF311, LF410, LF411, LF415e, LF416e Lanier Toner 491-0317 Lanier Fax Drum 411113 listed on this page is genuine Lanier brand not generic and not refilled unless it clearly posted "Generic" or "Rebuilt". The yield for Lanier brand fax toner is based on a 5% coverage of the printed page. Page Yield varies by the condition of your Lanier Fax or Lanier copier machine and how it has been maintenance. 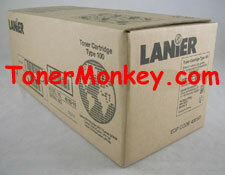 Lanier Fax Supplies and Lanier Copier Supplies at wholesale prices and flat rate shipping everyday.